Convio, a Blackbaud Company, is a leading provider of constituent engagement solutions that enable nonprofit organizations to maximize the value of every relationship. With Convio constituent engagement solutions, nonprofits can more effectively raise funds, advocate for change and cultivate relationships with donors, activists, volunteers, alumni and other constituents. Convio offers two open, cloud-based constituent engagement solutions for nonprofits of all sizes. Convio Luminate™ offers large, enterprise nonprofits an open, extensible solution that allows organizations to fully engage with individuals online and offline as well as analyze the relationships they have with donors, volunteers, advocates and other constituents to design tailored, integrated, multi-channel campaigns and interactions that are most beneficial to both the organization and the individual. Convio Common Ground CRM™ provides small and mid-sized nonprofits with a simple, easy to use, complete and affordable system that combines fundraising operations and constituent information so nonprofits can focus on their mission, not technology. Convio Services provide proven expertise and consulting to enhance our solutions and help organizations translate their mission into online or integrated marketing programs that successfully acquire, engage and convert individuals into lasting supporters. Each step helps produce measurable and sustainable results for any initiative — fundraising, advocacy, list-building, communications, and stewardship regardless of the channel of engagement — traditional, digital, social or mobile. Convio TeamRaiser™ is the de facto standard for event fundraising, powering almost 70 percent of online funds raised by the nation’s 30 largest fundraising walks, runs and rides. TeamRaiser is available as part of Luminate or as a stand-alone application. Innovative Software and Services: to reach people, better understand and manage relationships and develop and implement multi-channel and one-to-one campaigns that move people to support a nonprofit’s mission. Proven Results: that set the standard for marketing, fundraising and advocacy for the nonprofit sector. Thought Leadership: that connects people and causes with ideas, information and best practices to build a dynamic nonprofit community. Passionate, Experienced Team: to bridge traditional engagement channels with the new world of digital, social and mobile. All our software runs in the cloud, the most cost effective and efficient way for nonprofits to leverage technology to transform processes and generate revenue. We pioneered cloud-computing for nonprofits with our online fundraising solution more than a decade ago. Today, we are the only vendor with a 100% cloud-based solution focused exclusively on supporting the needs of the nonprofit sector. We serve more than 1,500 leading nonprofit organizations in the United States, Canada and United Kingdom, helping them bridge traditional channels with the new world of digital, social and mobile to more effectively raise funds, advocate for change and cultivate relationships with donors, activists, volunteers, alumni and other constituents. In 2010 alone, our US clients used Convio software and services to raise more than $1.3 billion dollars online, send more than 4 billion emails, power more than 32 million advocacy actions and manage relationships with more than 248 million constituents. One of the best ways to understand Convio is through the success of our clients. Visit our client success library and portfolio. Headquartered in Austin, TX, Convio has offices in Washington, DC; Overland Park, KS, Lincoln, NE; Emeryville, CA and London. We have more than 430 team members across the US and UK. In 2010, Convio’s team members donated more than 20,000 hours of volunteer time to nonprofit organizations in the communities where we live and work—this volunteer engagement is fully supported by the company through three paid days each year specifically for volunteering in the community. Through Convio Cares Grants and the generosity of our team members, we provided more than $100,000 in grants and donations to organizations across the country last year. In addition to the volunteer time-off, we host Convio Cares Week each spring where team members spend the week volunteering to support projects in the community. 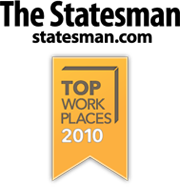 Convio was named the “Best Place to Work” in Austin based on feedback from our team members. We're sorry, but no upcoming events are scheduled at this time.